‘Bitten by the travel bug’ is a clichéd saying but the above quote hits the nail right on the head about how I feel about travelling. It had been just four months since my last trip to Ladakh and I was already longing for a break. Four months for a programmer means one major release, extended work hours and a few sleepless nights around the go-live date. So how do I rejuvenate? Head out on another trip! 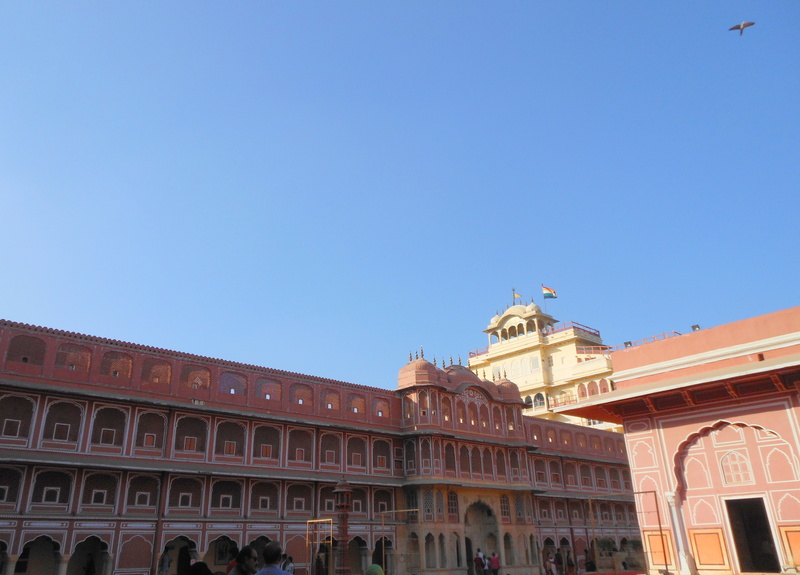 We started our tour from Jaipur, the capital of Rajasthan, also known as the Pink City. Jaipur was named after Maharaja Sawai Jai Singh II, the ruler of Amber. It is the largest city of Rajasthan and history has it that Jaipur during the regime of Sawai Ram Singh, was painted pink to welcome Edward, Prince of Wales. Even today the avenues remain painted in pink. 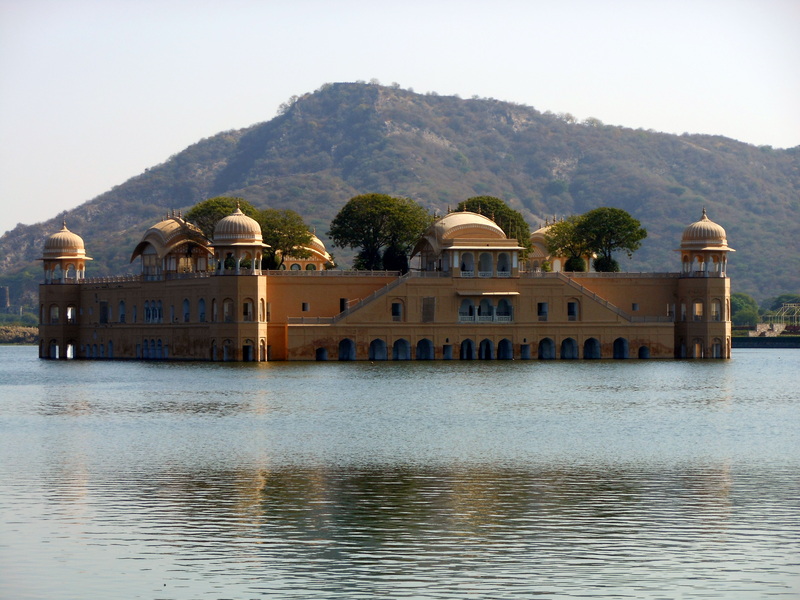 Jaipur has many monuments, the first place we visited on our trip to the land of royals was Amber Palace, located on a hill, built by Raja Maan Singh. Spelled as Amber and pronounced as Amer. The first thing that caught my eyes on our drive uphill was Elephant rides taken from the gates all the way up to the palace! I wonder how these giants managed the steep climb over cobbled paths. Our guide told us that each elephant is allowed to ride only four times per day and one way ride takes around an hour. Poor Elephants! Amber fort is made in red sandstone and marble. Every gate has an idol of Lord Ganesh, the deity who is believed to remove obstructions in one’s life. The idol is made of coral and placed over the main entrance or Pol. 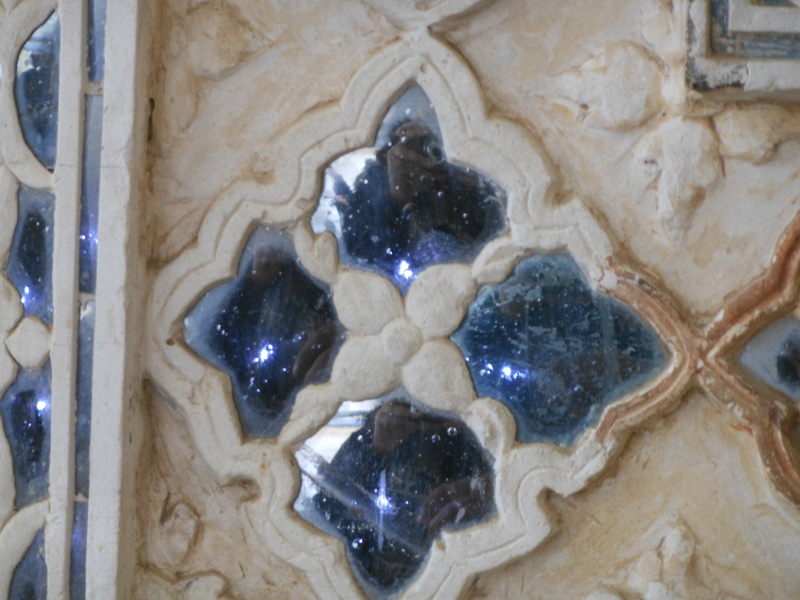 The interior wall of the palace depicts painting with carvings, precious stones and mirror settings. 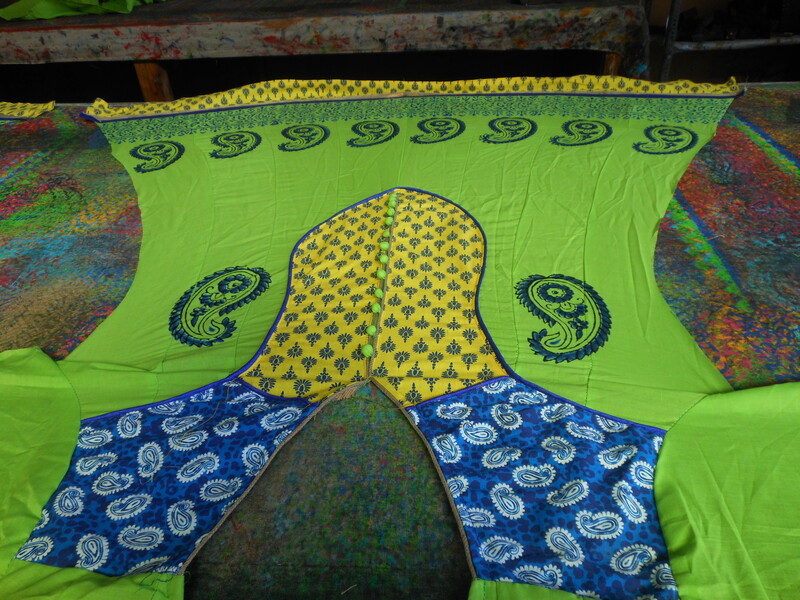 The paint that’s used is made of vegetable and fruit extracts. 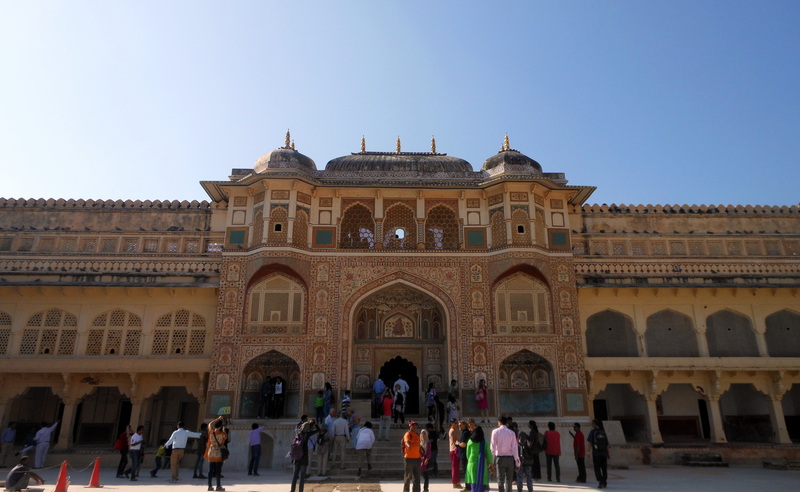 The palace complex consists of Diwan-i-Aam or the Hall of Public Audience, Diwan-i-Khas or the Hall of Private Audience, the Sheesh Mahal or mirror palace. Diwan-i-Aam consists of monolithic marble pillar with carvings of both Indian and Persian styles. The platform has 27 colonnades, where the king held his audience. 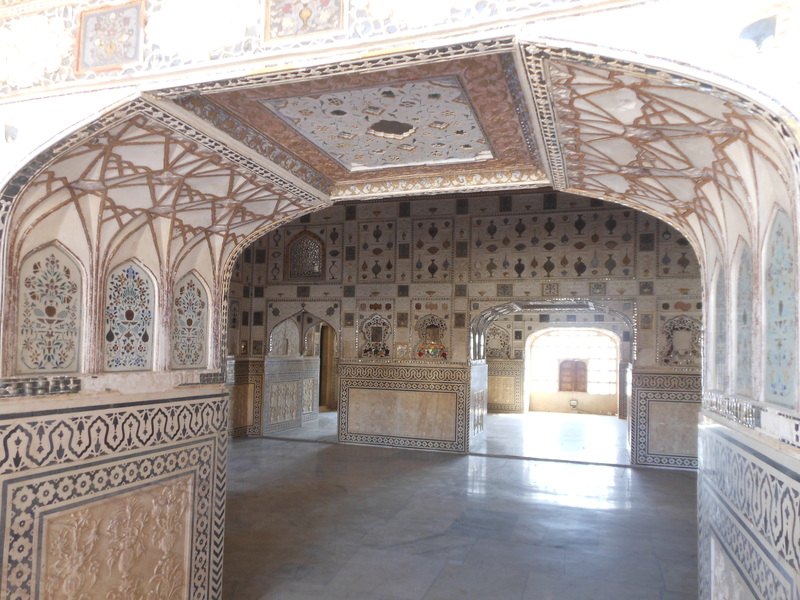 Diwan-i-Khas is an architectural marvel. The royal families were living in the Diwan-i-Khas during summers. 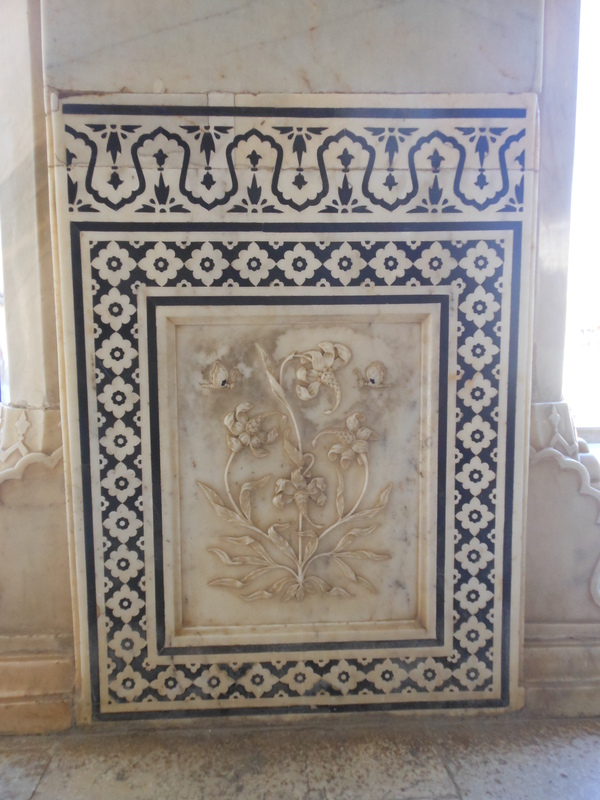 This part of the palace complex consists of chambers with marble cascades formed by a perforated marble screen. These cascades were provided with running water and with the breeze passing through, served as a cooling device. Sheesh Mahal, which literally translates to mirror palace has glass inlaid panels and multi-mirrored ceilings. Convex mirrors are used in such a pattern that if a lamp is placed at one corner, light reflects in all the mirrors and thus the ceiling appears like a star-lit sky! 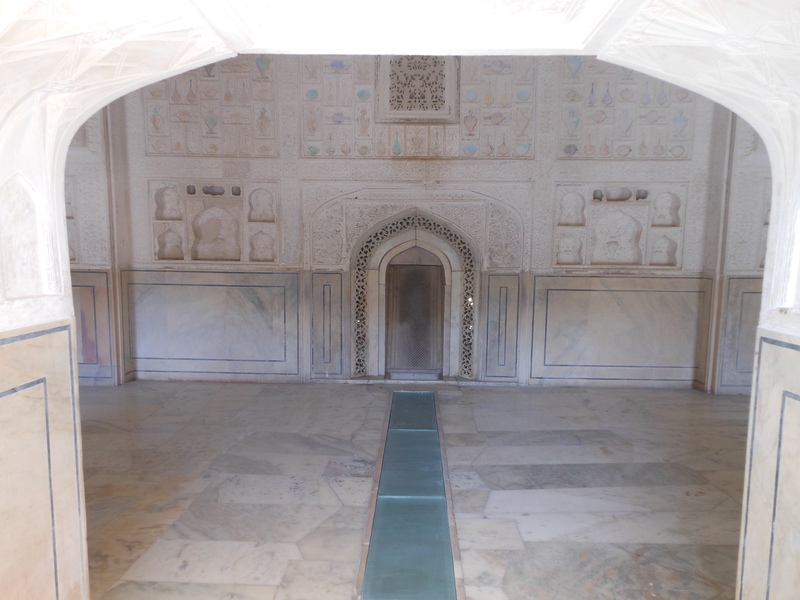 Sheesh Mahal was used by the royal families during winter. Another attraction of Sheesh Mahal is a marble pillar with carvings of flowers and hovering butterflies; the flower has seven unique designs of scorpion, elephant’s trunk, lion’s tail, lotus, fish tail. 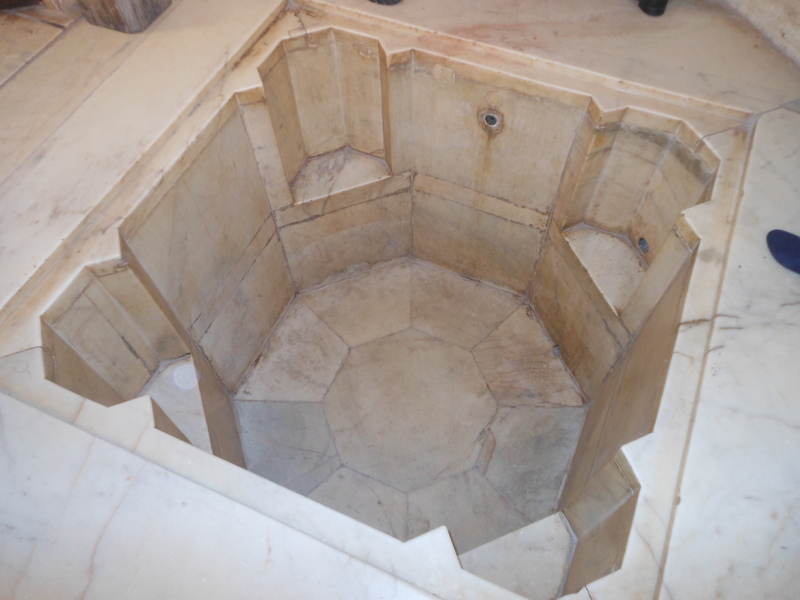 Adjoining the Sheesh Mahal, one can find Turkish Baths or Hammam. Tubs where hot and cold water were separately stored, changing and massage rooms and intelligently placed chimney can be found here. 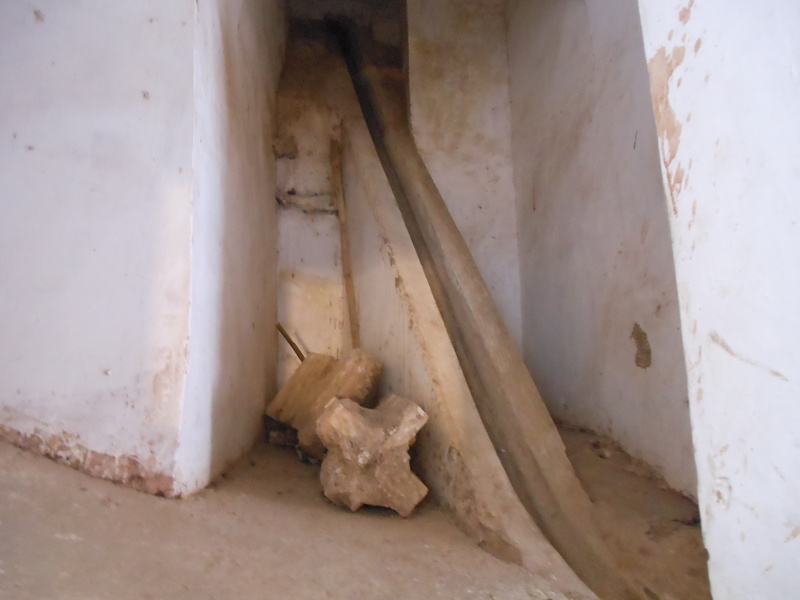 Amber fort also had rain water harvesting! 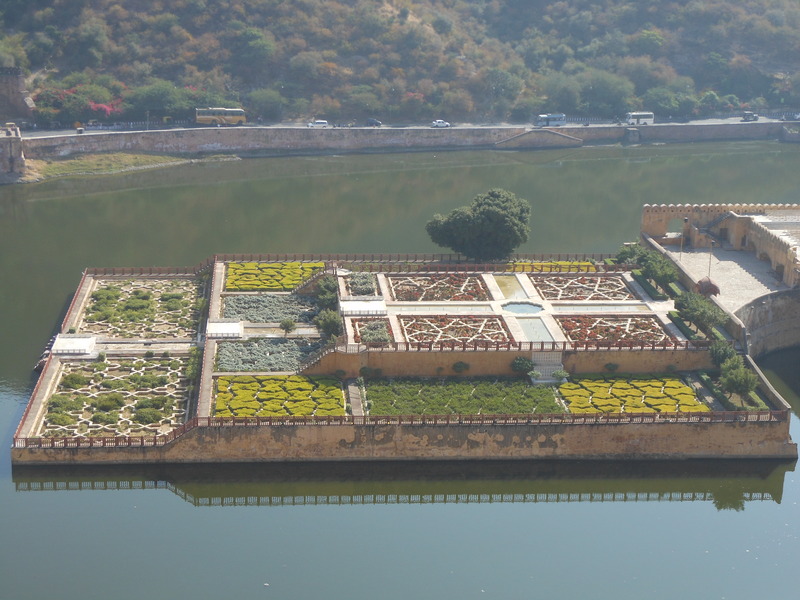 Amber Fort overlooks Maota Lake, which has a garden in the center. This garden is called Kesar Bhag as the Maharaja wanted Saffron plantation so that the fragrance would hit his Diwan-i-Khas. Due to unfavourable weather conditions, saffron was not grown here, however, a garden was still maintained. The architecture of this garden is in Persian style. Taking it all in, we left Amber for lunch followed by some shopping. On our way back we made a quick stop at Jal Mahal and Hawa Mahal. 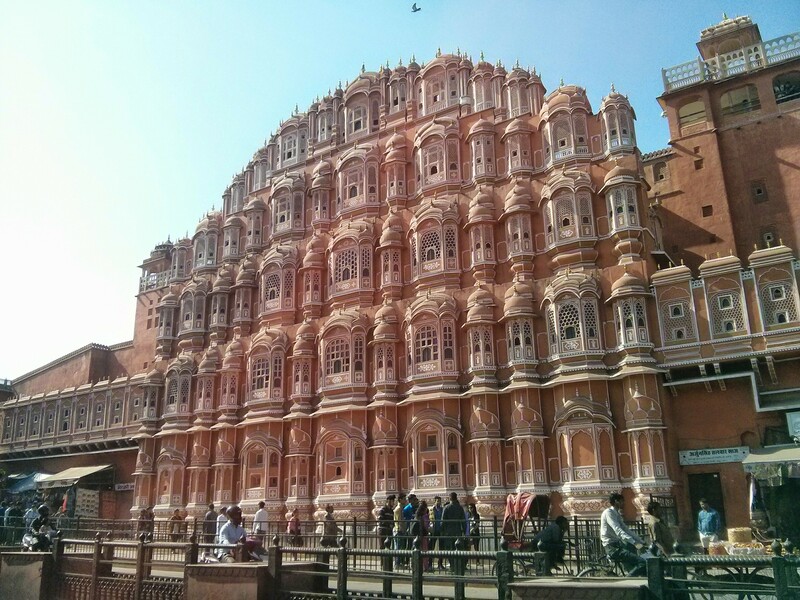 Hawa Mahal is located in the City Palace complex. 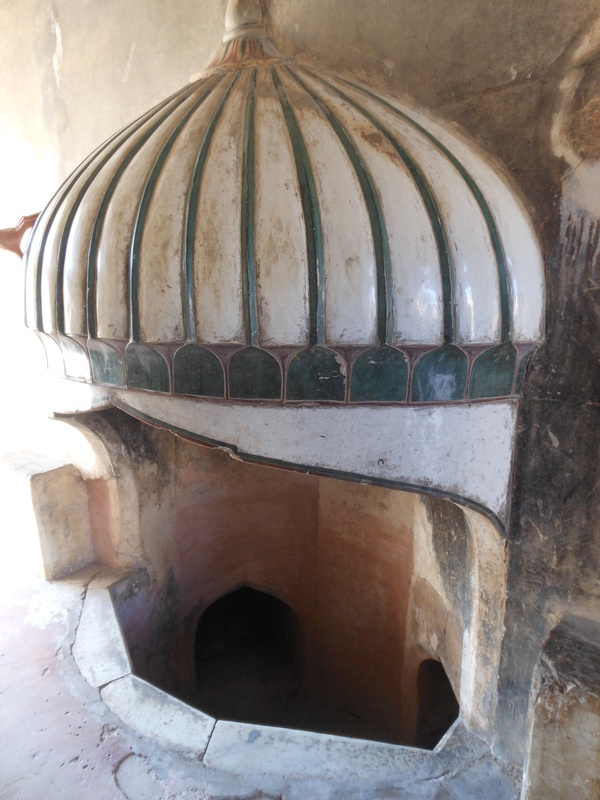 Built mainly for the ladies of the royal families to watch the city from their veiled comfort (purdah system). 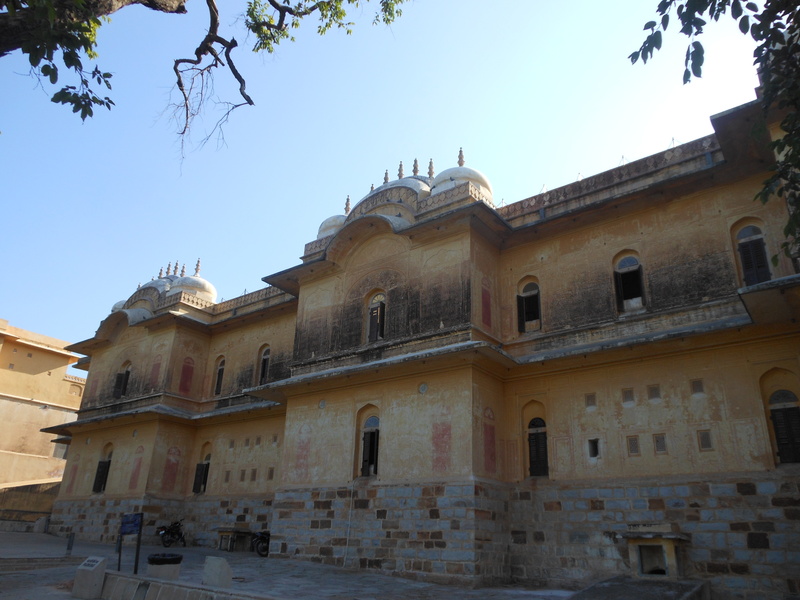 City Palace includes Chandra Mahal and Mubarak Mahal. The palace houses a museum but the greater part of it is still a royal residence. When we visited the palace, a part of the complex was being readied for a ‘Shahi Wedding’. Jantar Mantar is just around the corner from City Palace. It is a collection of architectural astronomical instruments built by Jai Singh. Delhi also has a Jantar Mantar but the one in Jaipur is the largest observatory and is one of the UNESCO World Heritage Sites. The observatory consists of fourteen geometric devices to measure time, eclipse, locate constellations etc. 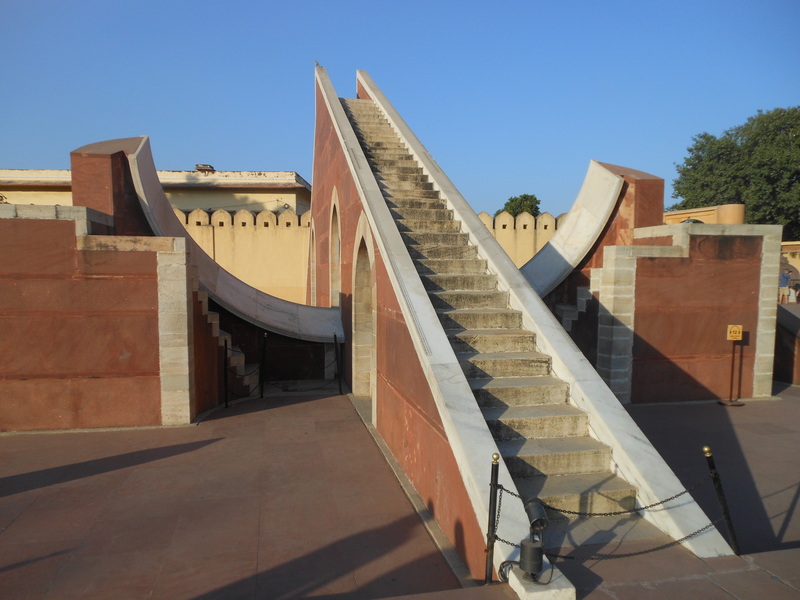 Jantar Mantar just proves that people of the yore were geniuses! Calling it a day we returned to our hotel for an overnight stay. 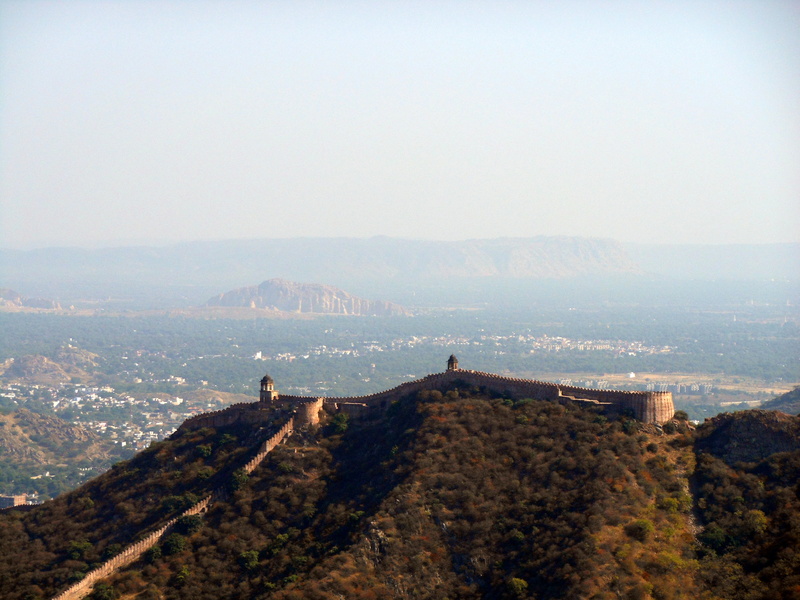 We started our day 2 by visiting another fort of the Royals- Nahargarh Fort, constructed on Aravali hills. After exploring Nahargarh Fort we left for Jaigarh Fort, which is also built on Aravali hills mainly to protect Amber Fort. On our way to Jaigarh, we saw many peacocks. 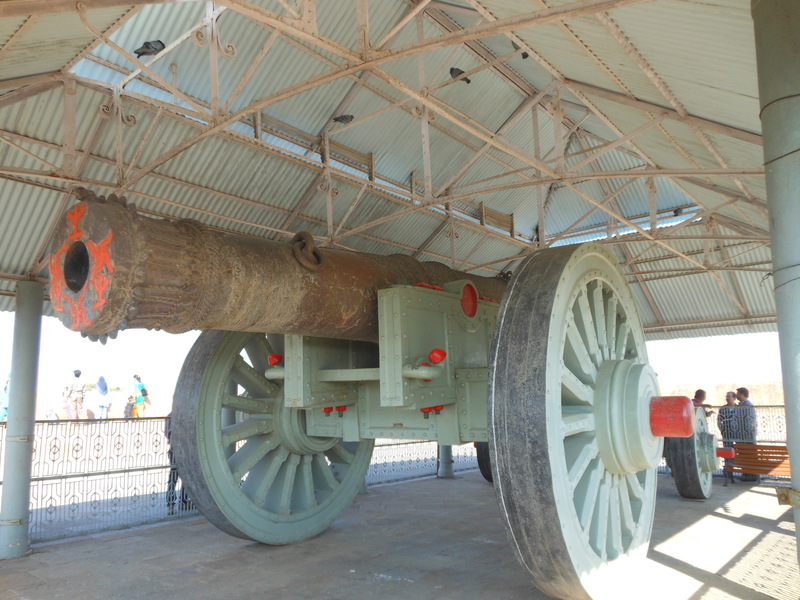 However, we were not lucky enough to see them dance (my ‘mhare hiwda mein naache mor’ is still an unfulfilled wish ) Jaigarh fort has many watch towers and houses Jaivana Canon, which happens to be the world’s largest cannon on wheels. A plaque at the entrance gives relevant information on the history of the canon, from which we learnt that it was fired just once. 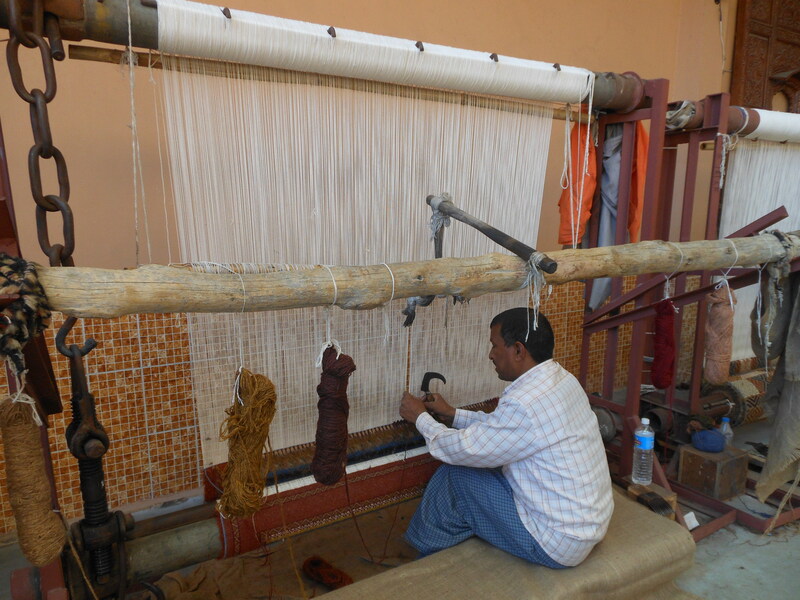 Apart from its heritage sites, the Pink City is famous for Sanganeri block printing. Sanganer is a town near Jaipur from where the style originated.Traditional Rajasthani print generally comprises of animals like horses, elephants, peacocks, camels and Rajasthan’s famous romantic couple – Dhola and Maru riding a camel. 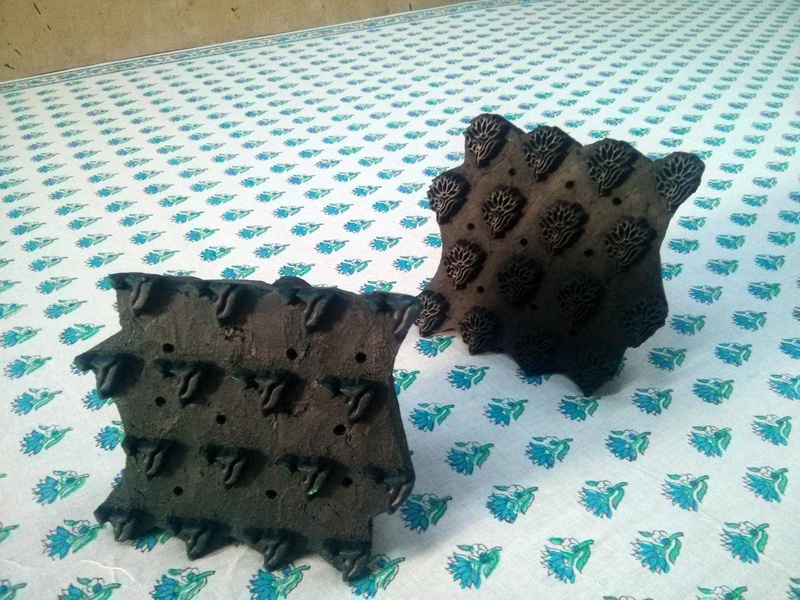 The block is made of wood with carvings which is then dipped in a tray of dye made from vegetable and fruit extracts. 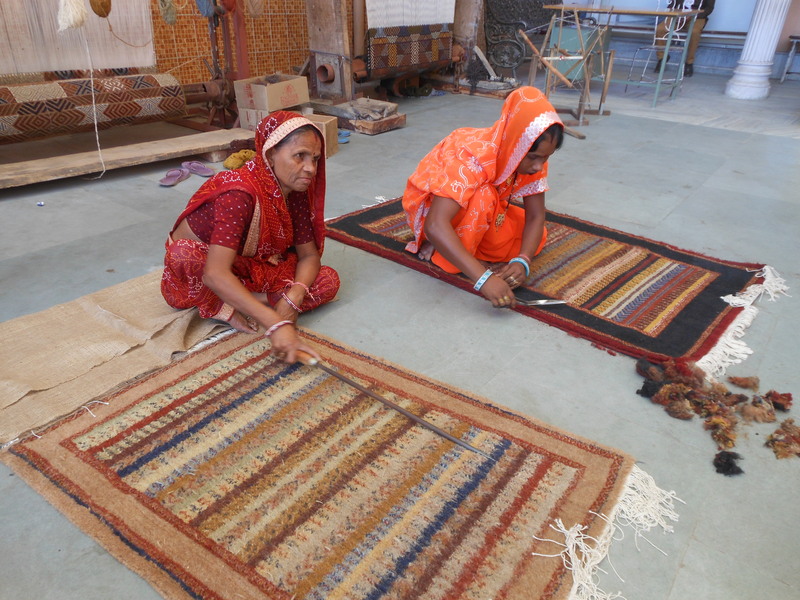 Jaipur is also known for its carpets weaving, gemstones, Bandhej/ Bandhini meaning tie and dye method, Razai- quilts or comforters made of wool and cotton. It is also famous for Lac Bangles made of white clay. 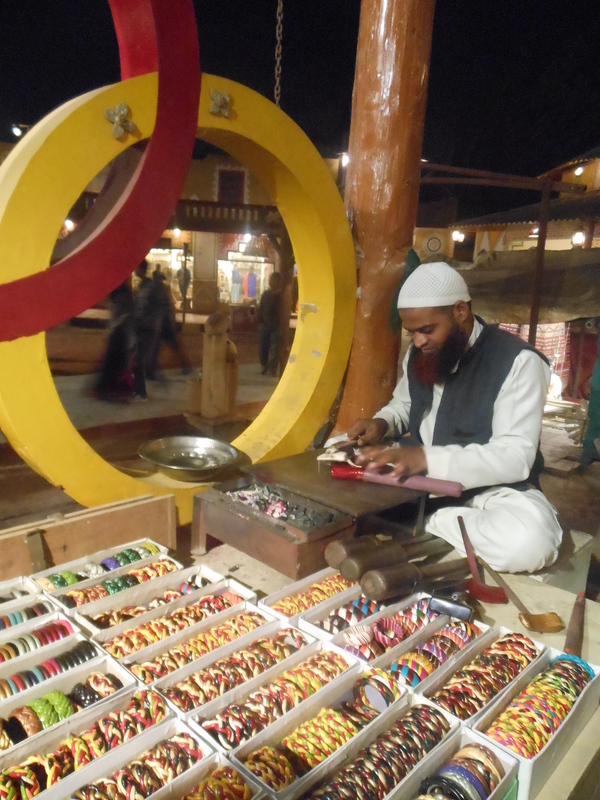 We got a chance to see how these bangles were made and I can only admire their skill. 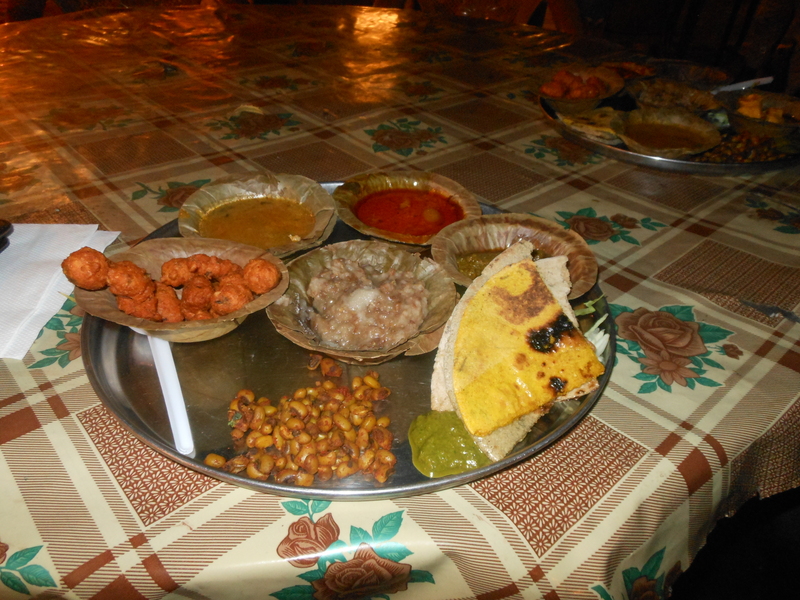 A visit to Jaipur is incomplete without visiting Chowki Dhani – a Rajasthani village themed hospitality. Though Chowki Dhani is present in many locations of the country, I wanted to visit the one in Rajasthan (feels more authentic, you see ) Entry to the theme park costs 500INR for open air dining and 750INR for Royal dining. 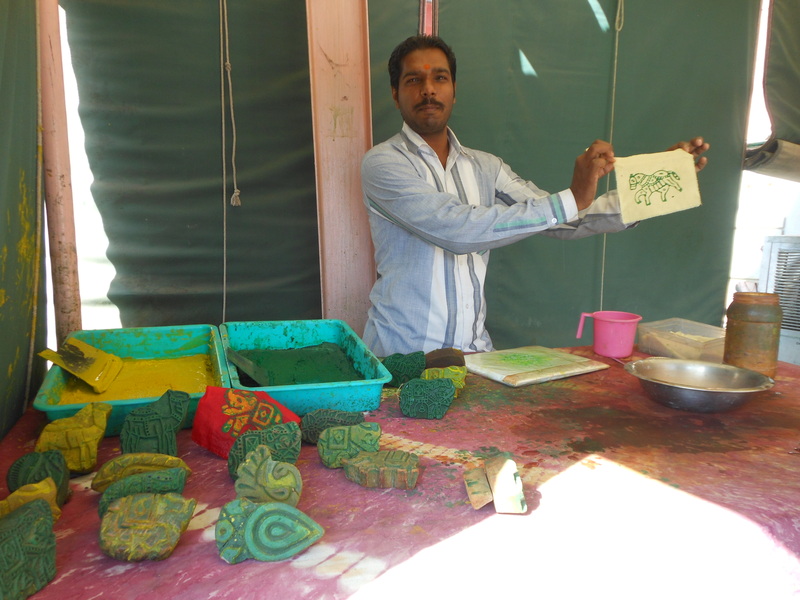 One can enjoy the puppet show, Rajasthani folk dance- Ghoomar, Elephant, Camel or Bullock cart ride, boat ride, play different recreational games and try their hands on pottery. We could find kiosks where artifacts were sold, ladies applying Mehendi (Henna) for free and artisans working on their crafts. 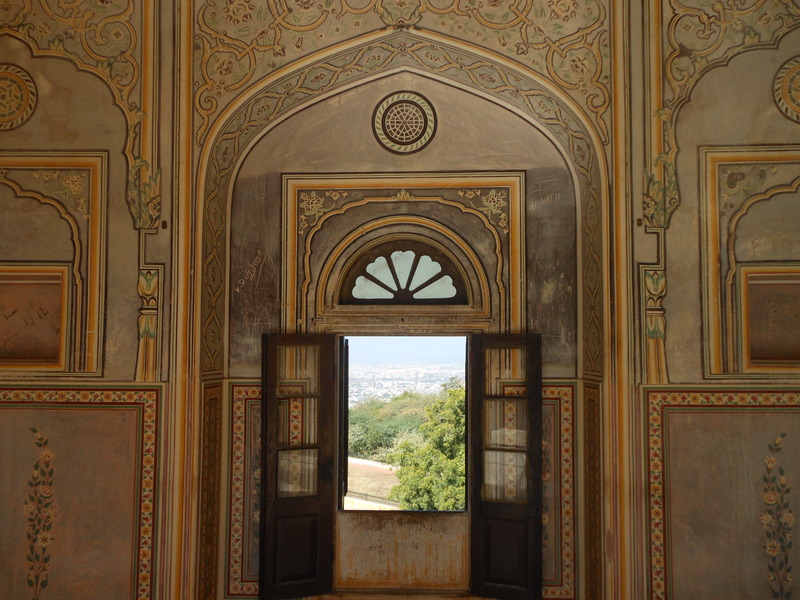 Thus my Jaipur exploration comes to an end. The princely nature of this land leaves a fascinating experience. 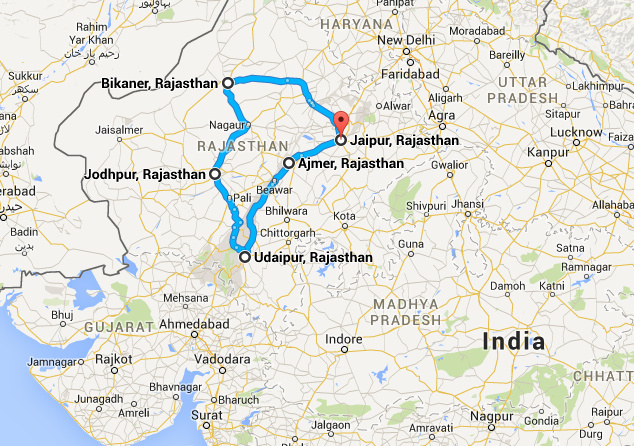 For ease of reading, I have separate posts on the rest of the places from my trip – Udaipur, Jodhpur, Bikaner.